Deep in southwest Mongolia, in the arid shadow of the Altai Nuruu Mountains, a little-known bear ekes out a perilous existence. The Gobi Desert has a host of endangered wildlife, but today the Gobi bear -- a subspecies of the Brown bear known to scientists as Ursus arctos gobiensis -- is one of the most threatened animals in the world. Scientists estimate only 22 to 30 of the bears are left, all in the wild where they face shrinking water supplies thanks to global warming. Slightly smaller than the Brown bear, the Gobi bear -- or Mazaalai, as they are called in Mongolian -- are the only bears adapted to a desert climate, says Harry Reynolds, an American bear expert who started the joint Mongolian-American Gobi Bear Project research program in 2005. "Gobi bears are special because they can live in an environment no other bear can. Brown bears from almost any other place could not live here and survive," says Reynolds, a retired wildlife biologist and former president of the International Association for Bear Research and Management. Unlike other Brown bears, Gobi bears are chiefly vegetarian, relying on a diet of wild rhubarb roots, berries, wild onion and other desert flora. Though similar in size, the scant food supply usually means they weigh much less. Otherwise, due to their reclusive nature, small numbers, and the sheer immensity of their inhospitable home terrain, very little is known about the Mazaalai. In 1943, a Mongolian-Russian team confirmed their first sightings. By 1953, local scientists had carried out a few studies and successfully lobbied a hunting ban. Boosting biodiversity in the region, Ulaanbaatar declared a 52,000 square kilometers national park in 1975 -- which it remains today as the Great Gobi Strictly Protected Area (GGSPA). Even so, many species living in the Gobi, Asia's largest desert, are tottering on the brink of extinction. "Annual precipitation is only about 50 millimeters. Shrinking water sources because of climate change have a huge influence and cause shortages of food and nutrition for wild animals," says GGSPA Director Batmunkh Mijiddorj. Scientists disagree whether humans or climate change have caused the bear to retreat further into the desert in recent years. Sightings are now limited to a few scattered mountain ranges near the Chinese border. But evidence suggests water supplies are quickly vanishing. "One of the indications there could have been more water in the past is the presence of trees along drainages and near some of the springs. Some of those places have no young trees,” says Reynolds, who believes disappearing water is the biggest threat facing animals in the Gobi. Budget constraints and extreme conditions in the Gobi are the chief challenges to research and efforts to establish a concrete conservation plan. But a supplementary government feeding program, launched in the 1980s, has been critical: The bears are highly dependent on the food troughs when they come out of hibernation in spring, before their natural food has grown, say researchers and park rangers monitoring the bear habitats. 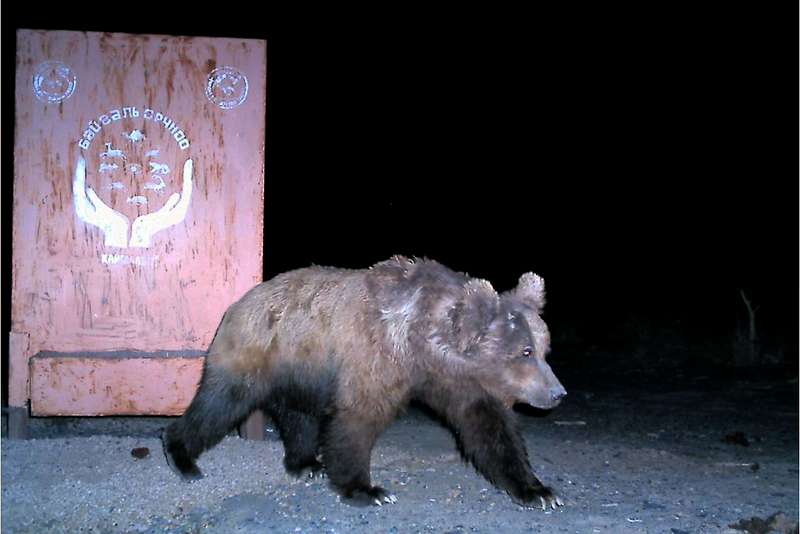 Feeding points now serve researchers who collect data with remote cameras and fur traps. "The least we can do at this point is to provide better quality forage for the bears so they can retain their fat for breeding, and to rehabilitate the springs and make them better available to the animals," says Reynolds, who opposes attempts to breed the animals in captivity, a desperate measure promoted by officials from the National Commission for Conservation of Endangered Species. "The first rule is to do no harm. The bears are in such a balance right now that one little thing could tip them over to extinction and removing a viable breeding population from the wild could be it," he argues. Given the odds and the rare sightings, scientists have been skeptical about the bear's chances for survival. In 1998, one researcher predicted the Mazaalai would be extinct by 2010. But enthusiasts are keen to defy the skeptics. "We're better off living with hope than no hope. The Gobi bears have shown themselves very resilient in adapting to a harsh environment and if they continue to do so with just a little bit of help -- that's what we're after," says Reynolds.